On Thursday, tournament players could enjoy the start of the new edition of the 2019 XL Blizzard Series on one of the biggest online poker rooms, 888poker. On the first day of the series, they kicked off with the $100,000 Opening Event and during the day, two more events started. The first event of the XL Blizzard series came to an end with Russia's "plomoor" taking down the $100,000 Opening Event for $16,458. "plomoor" started the final table as the leader and was none stop betting throughout the last hours of the tournament. They put their foot on the peddle and never let off as they rode their way to the end, using an immense amount of aggressive pressure. 888poker's Ana Marquez, "onyvapapaa1," and "MrDrogo" dropped early in the final table, failing to get any traction as they could not overcome the constant raises from "plomoor." "V.BlomFan60" would be the sixth-place finisher, getting it in with the best against "plomoor," but they would not be able to dodge a spade on the river, being eliminated. "Leqenden" lost a big hand that left them short, and would move all in the very next hand. "plomoor" would be the finisher on yet another final table player, busting "Leqenden" out in fifth with two pair. "elhanna17" laddered up to fourth before taking a few shots and pushing their king-eight into the king-jack of "metis996," with no avail as "metis996" took down the pot, eliminating "Leqenden." "joph8ralph" found themselves in a three-way battle with two monster stacks. When they found an ace, they moved all in, only to run into the bigger ace of "plomoor." "joph8ralph" would not connect with the board, being eliminated in third place. Heads-Up play only lasted about twenty minutes, and it was a battle, to say the least. The chip lead was going back-and-forth, but when the dust had settled, it would be "plomoor" defeating "metis996." The final hand would be the queen-ten of "plomoor" against the ace-four of "metis996," and the window card was a queen. "metis996" failed to catch up on the turn or river and found themselves eliminated in second place for a respectable $14,991. For the players who couldn't afford the bigger buy-in ($109), there was a Mini edition of the Opening Event on the schedule. The tournament had a buy-in of just $16.50, and there were 1,262 players competing for a prize pool of $25,575. 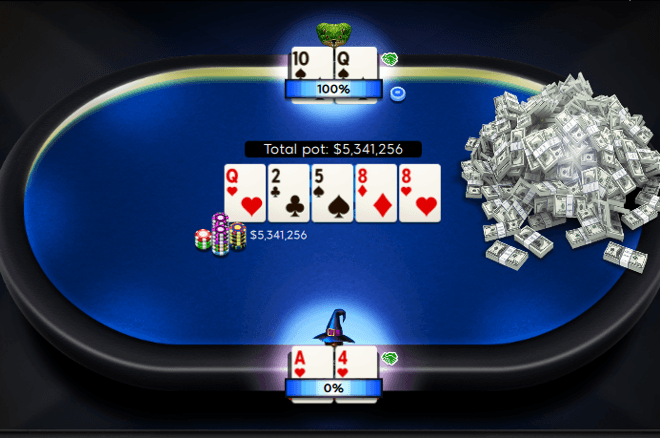 The final table was top heavy with all nine finalists in this tournament securing themselves of $276 while the top prize was $4,348. After the eliminations of the players from the United Kingdom, Russia, and Ukraine, "sucre0104" went out in third place for $2,427. The heads-up was a Romanian party between "IlovePickles" and "JacktheCpt." The latter mentioned finished in second place for $3,197 while his fellow countryman won the event for $4,348. The third and final winner of the day was crowned in the XL Blizzard #3 - $20,000 Late Opening Event, where 387 players competed to create a prize pool of $25,050. After just seven hours and twentyfive minutes, it was Latvia's "shcirrr" who took the title and the first prize of $4,807. The Latvian defeated Russia's "Omfg72oAgain" in the deciding heads-up, after _Lord_Xenu_ finished in third place. In addition, 888poker is inviting players that participate in at least five XL Blizzard Events into a freeroll that awards a $12,600 WSOP Main Event package to the winner and three $2,700 Crazy 8’s packages to those who finish second through fourth.